After the Honesty pattern, I knew that more virtues would have to come. With St. Patrick's day coming up, it seemed like a good opportunity for another virtue. This time, it's forgiveness. Forgiveness? 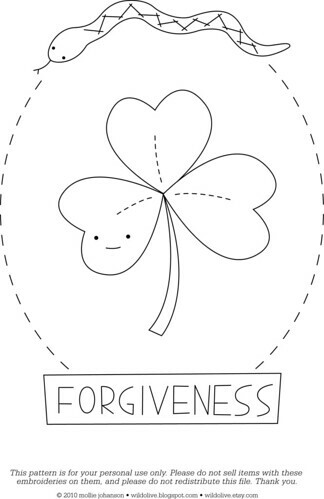 Well, St. Patrick was a slave in Ireland, but years later he was able to forgive and go back to Ireland, spreading the Good News of Jesus Christ and the forgiveness that HE gives. Enjoy stitching up this new virtue! You can get the pattern in various sizes at Flickr by clicking on the image. Nice. I like this one very much. Oh, I love this! And how apt to remind us that there's more to St. Patrick than green beer and corned beef ;-)! This is lovely! Thanks so much for another wonderful pattern. I'll be linking- just in time to get started for next year! =) I hope you had a great St. Patrick's Day!